Life sciences research remains a large market for Oracle. Oracle continues to invest in vertical solutions with significant future opportunity and limited direct competition. For example, large mega vendor competitors such as SAP lack presence in the CTMS while IBM and SAS Institute focus more on the performance management and information management. Software Insider estimates the EDC and CTMS market to be well over $1.5B in software and services revenue by 2012. Add $31B in NIH funding from the Fiscal Year (FY) 2010 Omnibus Appropriation Act (Public Laws 111-171) and the opportunity becomes quite clear. This is why direct competitors such as Bioclinica (i.e. TranSenda, Phoenix Data Systems), DZS Software Solutions (i.e. ClinPlus), eResearch Technology, IBM Cognos Clincial Trial Management, Lifetree Research, Medidata Solutions Worldwide, Mednet Healthcare Technologies, Merge Healthcare, OmniComm, Perceptive Informatics (TrialWorks), SAS Institute, and Study Manager have all succeeded in this market and have started to roll up the pieces. Oracle Health Sciences lacks a strong CTMS component. 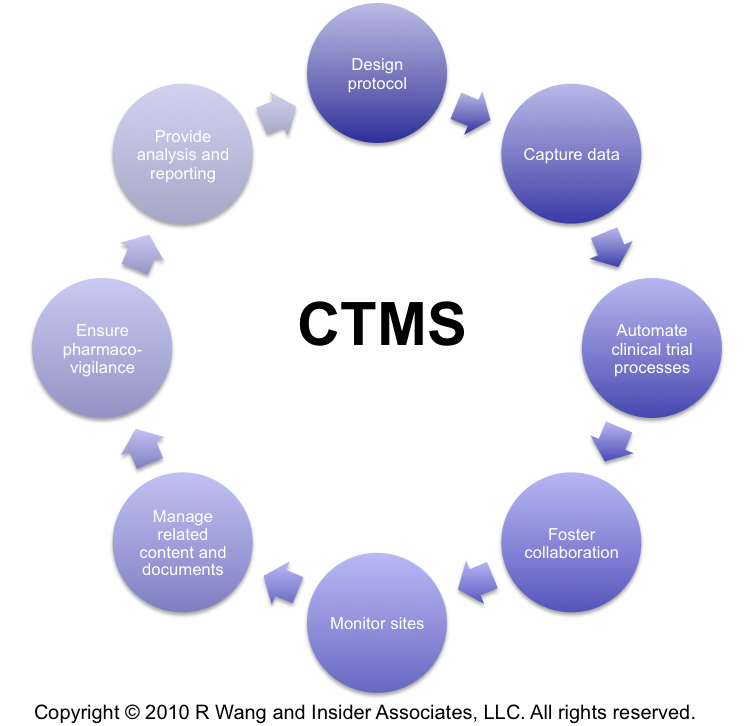 CTMS solutions streamline clinical development operations to manage multiple trials. As the information and management hub, a CTMS often orchestrates information and processes from EDC, clinical data management system (CDMS), adverse event reporting systems (AERS), interactive voice response systems (IVRS), and other reporting and statistical solutions (see Figure 1). Oracle’s existing solutions focus more on components such as drug discovery, EDC, adverse event reporting system (AERS), and some statistical analysis. Phase Forward brings together a series of clinical data solutions, randomization and trial supply management, Phase 1 clinic automation, safety solutions, clinical development center, late phase and ePRO solutions, and CDISC standards. Customers seek an integrated offering. Life science companies face competing pressures to bring solutions to market and to address patent expiration. With the skyrocketing costs of bringing new products to market, existing Oracle customers and prospects seek the “holy grail” of one integrated offering to reduce costs, manage risk, and provide insight into future innovations. Unfortunately, today’s customers must turn to different solutions for drug discovery, pre-clinical testing, Phase 1, Phase 2, Phase 3, FDA Review/approval, post market testing, and safety monitoring and reporting.